Print this page. 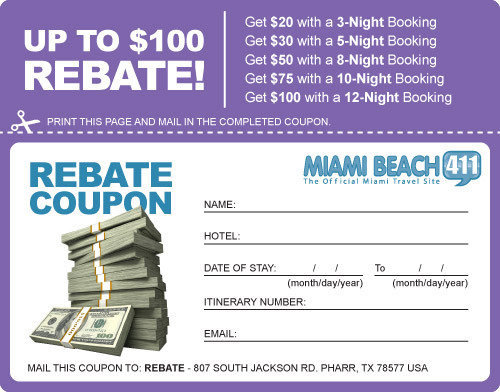 Cut out the coupon above, write in your name, hotel, days of stay, booking number, and mail it after your completed stay. The online coupon is only valid for reservations on Special Internet Rates, booked and prepaid through Hotels.com Reservations Network. Rebate does not apply to vacation package hotel stays. Coupon valid for reservations booked online January 1, 2012 through Dec 31, 2012 for travel dates: January 1, 2012 through January 31, 2013.